Alternatives Inc. Hosting Second Annual Alternate Route 8k Run for Youth on Sunday Reviewed by Edgeville Buzz on May 14, 2009 . 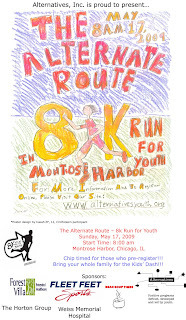 Alternatives Inc., a youth and family agency serving northeast Chicago, is hosting its Second Annual Alternate Route 8K Run For Youth this Sunday May 17th at 8AM in Montrose Harbor. The cost is $35 on the day of the race. To register or find more information about the event, please visit alternativesyouth.org.